Polish general; born 1599; died at the village of Sokolovka, Volhynia, Feb. 12, 1664. Czarniecki distinguished himself in the wars against Sweden and Russia (1656-61), but unlike Wishnevietzki, who stands out as the protector of the Jews during the Cossack uprising, he dealt very harshly with them. After the Cossack rebellion of 1648 he joined Prince Potocki against Chmielnicki, but was surrendered to the Tatars after the defeat of the Poles at the Yellow Waters (see Cossacks' Uprising). He was released after a captivity of two years, then fought against the Cossacks again, and helped to defeat them near Berestaczko. When the Swedish king, Charles X., invaded Poland and forced John Casimir to flee into Silesia, Czarniecki hastened to Cracow and besieged the castle, but lack of provisions soon forced him to retire. Poland was now made the battle-ground for Russia, Poland, and Sweden, and the Jews, receiving protection from none, were harshly dealt with by all. The communities which had been spared the fury of Chmielnicki and his followers now felt the effects of the conflict. The Russians showed them no mercy; the Swedes gave them no protection; and the Poles accused them of being friendly to the Swedes, and cut them down in great numbers. Czarniecki dealt remorselessly with them. Retreating from the Swedes, he devastated the country and vented his rage on the Jews. He is said to have killed 200 in Kobylin; 100 in Mezhirich; 100 in Wreschen; 300 in Lenczyc; 600 in Kalisch, Posen, Petrokov, and Lublin. Hundreds of families were exterminated in Cracow (1656); many Jews, in order to escape a worse fate, drowned themselves in the river; and others changed their religion. The Poles destroyed the synagogues and took great delight in tearing up the Holy Writings. Some of the most important communities were utterly destroyed; others were reduced to a pitiful condition of ruin and helplessness. 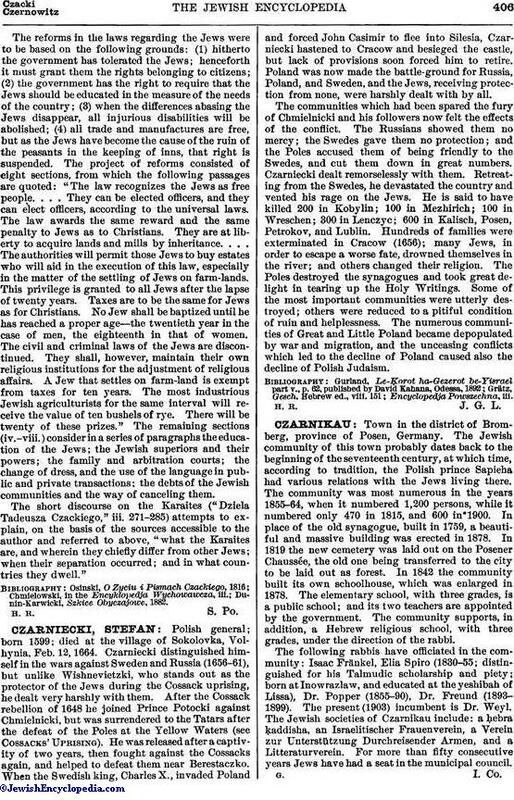 The numerous communities of Great and Little Poland became depopulated by war and migration, and the unceasing conflicts which led to the decline of Poland caused also the decline of Polish Judaism.